This leaftlet is significant for using two advertising strategies that became popular in the Victorian era. 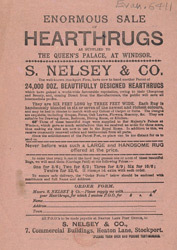 The first is to imply the existing popularity of the product ("another parcel of 24,000 doz[en] beautifully designed hearthrugs which have gained a world-wide favourable reputation") rather than to state actual sales figures. The second is to use well known figures as a means of endorsement. Here, Nelsey & Co state that they are suppliers to "Her Majesty's Palace at Windsor".